After forcing founder Hank Pym (Michael Douglas) out of the company, Darren Cross (Corey Stoll) plans to unveil Pym Technology’s newest invention. Cross’ team has created a suit capable of shrinking a human to the size of an ant. The suit will allow an army of almost invincible ant-sized men to carry out any number of operations, revolutionizing war. After getting out of prison, Scott Lang (Paul Rudd) tries to go straight. Scott realizes life for an ex-con is more difficult than he imagined. His friend, Luis (Michael Peña), introduces him to some “colleagues”, who have a tip on a big score. After easily breaking into a safe, Scott finds what he thinks an old, worthless motorcycle suit. As it turns out, the safe they broke into belongs to Hank Pym. The motorcycle suit is actually Hank’s old Ant-Man suit. Hank also holds the secret to successfully shrinking organic matter, the Pym Particle. This particle is what Darren Cross is missing, and why his attempts have failed. Hank and his daughter, Hope (Evangeline Lilly), train Scott to be able to use the suit and a device that lets him communicate with ants. They hope to stop Darren before he can perfect his own suit and sell it to the highest bidder. I know what you’re thinking. This is a superhero movie. About a guy who is the size of an ant. And he tells the ants what to do, and they help him? Sounds ridiculous, right? It’s not what you think. Marvel has done it again. Hear me out on this one. Michael Douglas’ Hank Pym seems to be taken directly from the comic book. At least, I’m assuming that is the case, given some of his superhero cheesiness. He brings the Douglas charm, that adds to the character. Paul Rudd takes the script from the team of Edgar Wright, Joe Cornish, Adam McKay, and Rudd, and adds that extra level of humor that only he can. While I was concerned at his ability to play a superhero, Rudd takes that lighter edge that Marvel movies have (as compared to their DC counterparts), and takes the funny up a level. Pair him with Michael Peña, and you have the funniest Marvel movie to date. With a supporting cast of Evangeline Lilly, Bobby Cannavale, and Corey Stoll, you’ve got an excellent cast that works well. It may be hard to imagine that a film of such a large-scale focusing on a small-scale hero can impress visually, but it definitely does. The scenes where Scott is working with the ants are definitely far-fetched, but they are done with the Disney/Marvel magic that makes them fill the screen. It really needs to be experienced in 3D on the big screen to be fully appreciated. 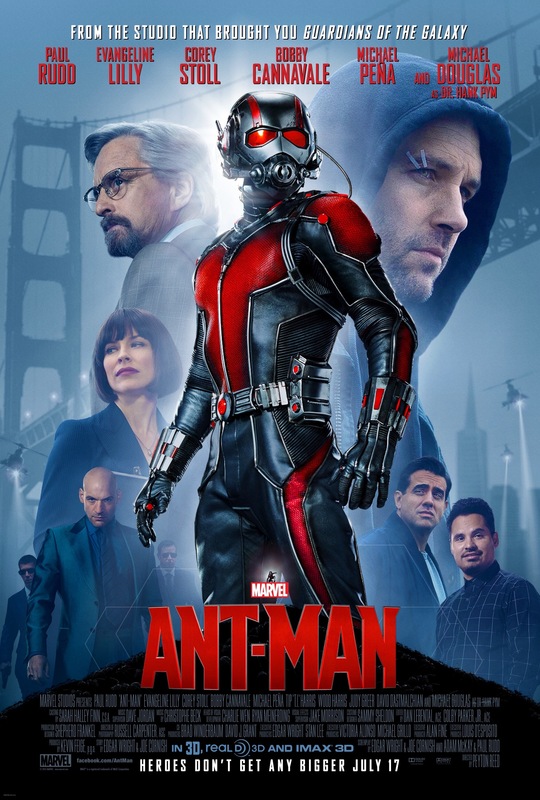 While Ant-Man is probably one of the lesser-known Avengers, the movie delivers on everything you’ve come to expect from the Marvel Cinematic Universe. Plenty of action and comedy for everyone. Even my 6-year-old daughter enjoyed it. This makes it good for a family movie night. Make sure you stick around through the credits. This is a Marvel movie, after all. There is a mid-credits scene that gives a look into what we can expect in the sequel. And at the end of the credits, we get a scene that sets up the next Captain America film.